I truly believe people have judged M. Night Shyamalan too harshly over the years. I saved Signs for last. Not because I think it’s the best film of M. Night’s, but rather my personal favorite – and one that I’ve seen the most out of all of the films. Thus finishing all of the films by M. Night starting with The Sixth Sense – and you know what? I like most of the movies. There are only a couple that I wasn’t the biggest fan of, but the rest I either really loved or really liked – so take that as you will. Signs is my personal favorite for so many different reasons. Signs stars Mel Gibson in what I think is his best role – Graham Hess, a retired reverend who has previously lost his faith in God and lives on a farm with his brother and two children. When crop circles show up in his corn field, they have to come to terms with the fact that they may not be the only ones in the universe, and that they may actually be in danger. 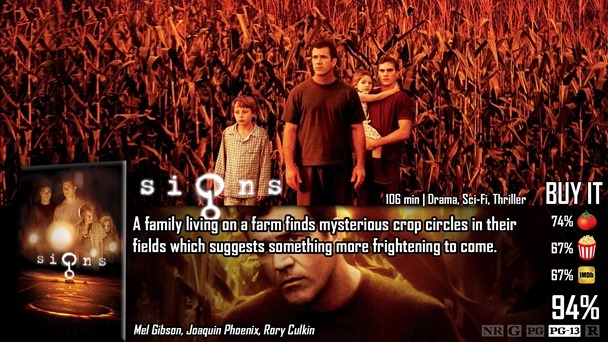 When you really think about it, Signs isn’t exactly what you would expect from M. Night Shyamalan in terms of mystery. You would think that, maybe, it would be a film where the audience has to guess if it is actually aliens, meddling kids, or simply their imagination. Instead, it’s pretty clear early on that we’re dealing with aliens. It’s not the what that’s important, but rather the why – and what that ultimately means for this slightly already broken family. It ultimately brings them a little closer, and it’s awesome just to watch their chemistry with each other. You wouldn’t expect a character drama from the film, but that’s exactly a huge part of the movie…but thankfully it blends perfectly with the creepy, horror aspect of the my mysterious beings from another world. Also, again with M. Night Shyamalan with water! In Unbreakable, Bruce Willis’s weakness was his sensitivity to water; in Signs, you deal with the daughter’s issue with water and what that measures up to in the end, Lady in the Water is obvious, even The Last Airbender, you had a plot that drew a lot of it’s importance from water bending. In his films, he deals with these physical elements that have a bigger, unknown importance to the overall story – like the color red in The Sixth Sense and The Village. It’s partially how you know it’s a project of his – but he discarded the idea of a physical element since, and I hope he gets it back for The Visit next year. No, this isn’t the best M. Night Shyamalin film, but it’s my personal favorite; it may even be one of your personal favorites. It just has a lot going for it that you can connect and fall in love with. Everyone’s performance goes by really smoothly and effectively, the underlining messages of the sour-resentful feelings brought on by broken faith and how that ultimately affects a family reflects something really believable, etc. The visuals could have used a little help in terms of the CGI aliens, but it’s not a big deal because they are usually in shadows – but still. Signs may not the best movie in the Shyamalin universe, but it has the potential to be one of your favorite flicks – thanks to the performances of all of the lead characters, their character development, and the rising tension throughout the film – both in a physical and emotional stance. Not a lot. 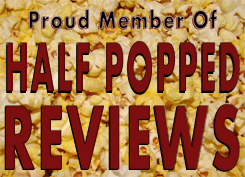 The visuals weren’t the best versus some of M. Night’s other flicks, but that’s hardly anything to complain about. If anything – it’s just not as well done as some of M. Night’s other works – not that I really care about that or anything. This is actually one of his better ones, in my opinion. Good review Dave. The twist may be dumb, but the whole thing leading up to is incredibly effective and compelling. All because Shymalan kept us in the dark so very long.